This article is about the character in Super Mario Odyssey. For other uses, see Cappy (disambiguation). Official artwork of Cappy from Super Mario Odyssey. 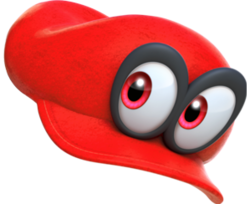 Cappy (キャッピー, Cappy) is a major Mario character introduced in Super Mario Odyssey. Cappy in the Cap Kingdom in Super Mario Odyssey. Cappy was introduced as Mario's latest companion in Super Mario Odyssey, with the motivation of helping him stop Bowser's wedding on the moon in order to rescue Princess Peach and his sister, Tiara. Cappy is a Bonneter originally from the Cap Kingdom. His signature ability is notably being able to be thrown about at his own will, and possess several entities in the Mario universe. In Super Mario Odyssey, Cappy can be either fully part of Mario's abilities or be separately controlled by a second player. He also changes his appearance with the hat of Mario's choice, with his eyes appearing in the center to show off that he's there. Cappy's eyes are revealed when Mario peforms the Super Jump Punch. Cappy appears cosmetically within Mario's moveset while using up special, Super Jump Punch. When he appears, the coins that appear change to that of the regional coins from New Donk City. He also appears as Mario's side taunt, where Mario throws him with Cappy circling around him once before Mario catches him and puts him back onto his head. In both instances that he appears, he retains the appearance of Mario's hat. He is also available as a hat for the Mii Fighters. Cappy also makes an appearance as one of the many Spirits obtainable throughout the game's Adventure Mode: World of Light. He's listed as a Support Class Spirit, giving the character the "Strong Throw" attribute. This is likely a reference to the use of Cappy in Super Mario Odyssey, being thrown frequently in Mario's adventure. This page was last edited on March 20, 2019, at 13:09.